Lt. Gov. Shan Tsutsui and former U.S. Senator Dan Akaka will preside over the Lieutenant Colonel Promotion Ceremony for Hawaii State Rep. Mark Takai on Tuesday, June 18, 2013 at 11:30 a.m. at the Office of the Lt. Governor, 5th Floor, Hawaii State Capitol. Takai is a member of the Hawaii Army National Guard. Takai was commissioned a First Lieutenant in the Hawaii Army National Guard (HIARNG) on July 19, 1999 and worked as the Preventive Medical Officer. Currently, he is the Division Chief for Soldiers Services and a School Liaison for the HIARNG. Additionally, Takai serves as the President of the Hawaii National Guard Association and the President of the National Guard Association-Hawaii Insurance, Inc.
“I am extremely pleased to join Sen. Akaka as we officially recognize and promote Mark Takai to Lieutenant Colonel. 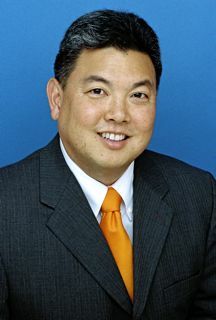 As a state legislator, Mark has served our community with double distinction,” Tsutsui said. Takai served in Operation Iraqi Freedom as the Base Operations Officer (Camp Mayor) at Camp Patriot, Kuwait from February 2009 to September 2009. He served as the Company Commander of Charlie Company (Medical), 29th Brigade Support Battalion from November 2006 to May 2008. Mark was also called to active duty for six months (May to November 2005) and served as the Hawaii Army National Guard Deputy State Surgeon. Among his numerous awards and decorations, Takai received the Meritorious Service Medal from the United States Army in 2009, the Distinguished Service Medal from the National Guard Association of the United States in 2011, and the Hawaii Distinguished Service Order in 2012. Takai’s official date of rank as Lieutenant Colonel was May 14, 2013. Congratulations! After you finish celebrating I hope you'll do a great job! Hope he really deserved the promotion and will prove to be worthy of it!